It’s relatively new, and you can get it by invitation only. It’s the smartphone that’s managed to dominate the market in a very short amount of time, an impressive feat accomplished largely due to a clever marketing plan. OnePlus One has earned the title as the new king of mid-range smartphones, and the buzz surrounding the product is still growing at an unprecedented rate. The demand for the invite-only smartphone was so great that traffic to the website skyrocketed, reaching 25.6M visits in December 2014 – just one year after the OnePlus website was launched. One Plus’ aggressive marketing strategy has three main elements, all of which are innovative in themselves. Combine them together, and you’ve got a triple threat three-pronged marketing strategy that has thus far been highly successful at fueling the hype – and demand – for this new smartphone. The phone is cheap, but without compromising quality. It’s relatively low priced with a high specification ratio. It’s invite-only. This has been the driving force in creating the craze behind the phone, as the manufacturers are appealing to basic human nature: we always want what we can’t have. The buy by invitation only system allows the manufacturer to gradually fulfill the demand while customers are kept in a constant state of anticipation. This also adds to the phone’s appeal as a “VIP product” for only a “select” group of people. It’s something of a niche product. In opposition to all of their existing competitors, the OnePlus One has the reputation of being the phone for tech geeks. Add these three elements to a very clever ad campaign – complete with its own trending hashtag, and you’ve got the recipe for a smartphone poised to take over the market. Take a look at some of OnePlus’ effective ads. They’re clean, concise, and most importantly, poke a little fun at the competition. 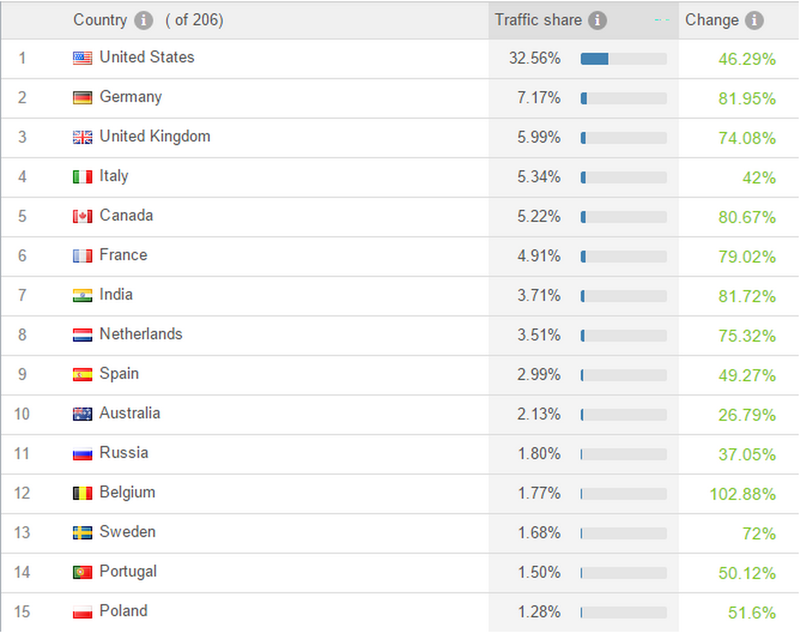 OnePlus’ marketing strategy was so effective that they managed to grab the word’s attention, as traffic to the product’s website comes from all corners of the globe. 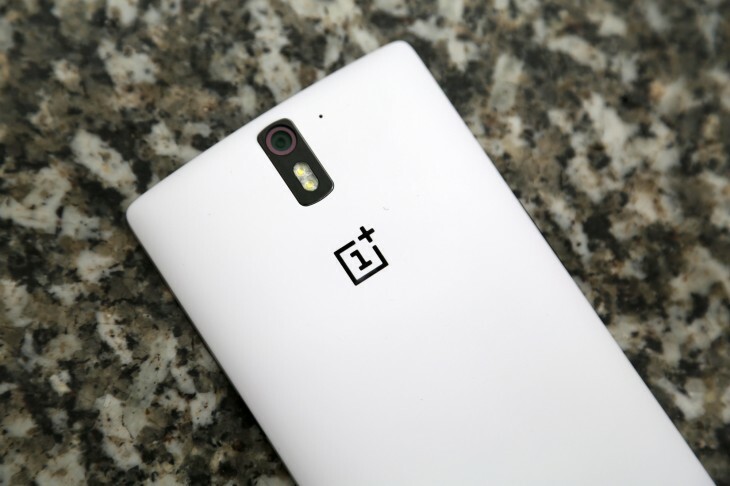 While the United States is undoubtedly the leading market for OnePlus One, you can see there’s a rapid surge of traffic from India, indicating that this may be a very promising new geographic market for the product. Other countries saw huge changes in traffic as well, as OnePlus One’s popularity continues to soar. The new smartphone’s reputation as the must-have phone for the tech-savvy lot had a direct impact on the OnePlus website. Referring tech-oriented sites helped fan the flames by directing traffic to the product’s homepage, and ultimately the referrers lent a big helping hand in cementing brand awareness. 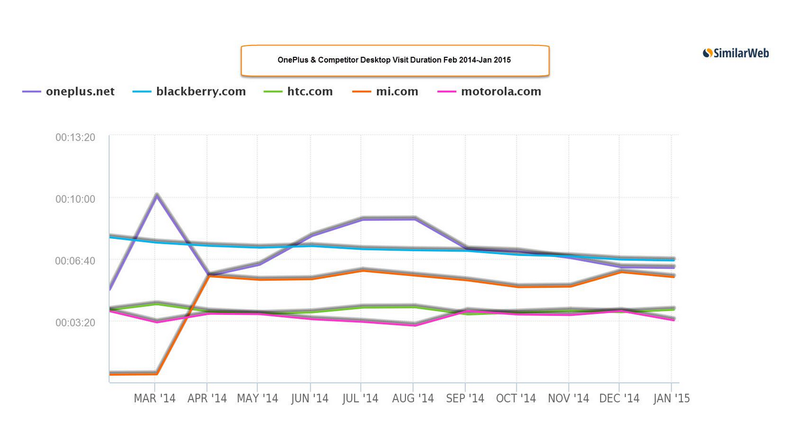 The chart below illustrates which publishers helped sustain the buzz about the phone through referrals. How was OnePlus faring compared to its competitors? Or perhaps more accurately, how were OnePlus’s competitors handling the entrance of this uber-popular newcomer into the market? To find out, we took a look at how the company was competing with their closest rivals in terms of traffic to their respective websites. For this comparison we used Blackberry, HTC, Motorola and Xiaomi. Based on this graph, it doesn’t look like much of a competition. You can see how quickly site traffic to OnePlus managed to surpass each of the competitors we analyzed in just a matter of months, and its traffic continues to rise. 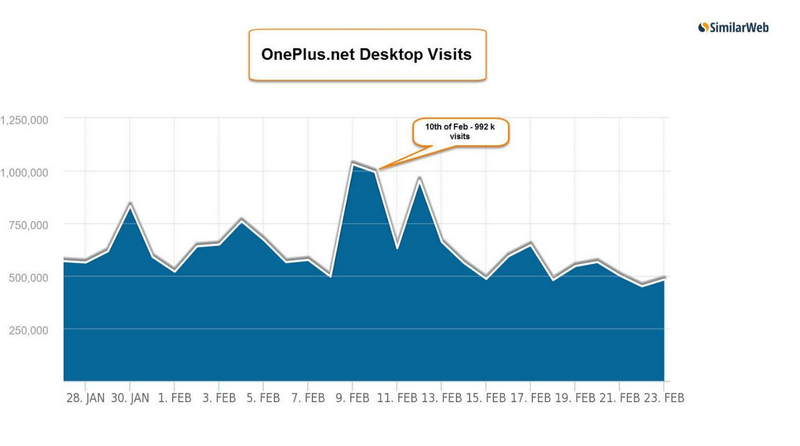 It’s also interesting to note that OnePlus visitors are more engaged, based on visit duration to the site. Now for the traffic breakdown by source: out of all of its main competitors, OnePlus One is the only smartphone with the greatest amount of traffic from Direct. 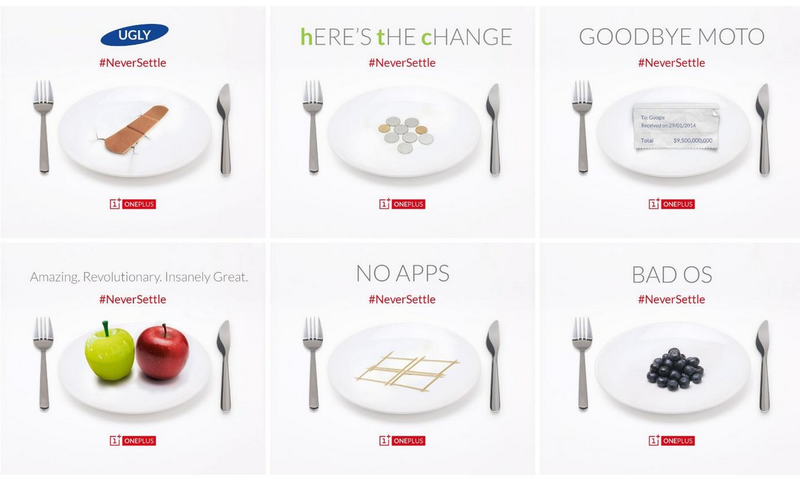 This illustrates how strong the brand is – clearly, OnePlus One’s reputation preceded itself. Perhaps this is most obvious, though, when you take a look at traffic from social media. Traffic from social media to the OnePlus website dwarfs the social traffic driven by their competitors. While certainly social media doesn’t even come close as a substantial traffic source when compared with other major traffic sources (especially Direct and Search), OnePlus One is clearly commanding the social scene. Social media provides the company with nearly 8 percent of total incoming visits and continues to rise, with Facebook, Reddit and Twitter being the main social media sites directing traffic. OnePlus One also has a very good distribution of traffic sources – another aspect that sets it apart from the competition. Again going back to the appeal of the phone’s exclusivity: When something is invite-only, everyone wants it… and everyone talks about it. One of the distinguishing features of OnePlus One’s marketing campaign was the invite-only incentive, which prompted some aspiring entrepreneurs to start selling invites. There was some question as to the phone’s sustainability given the business model. Then Black Friday and Cyber Monday happened. During that time, OnePlus temporarily removed the invite-only requirement for purchase, and allowed people to simply buy the phone on the website. The results speak volumes about the phone’s brand presence. 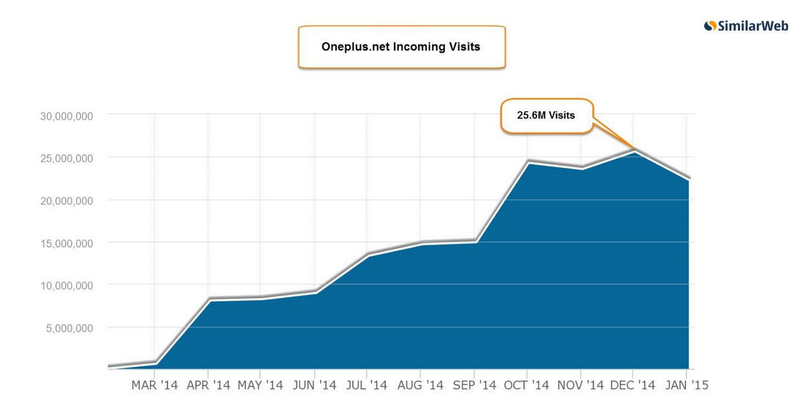 On October 28th, the OnePlus website received nearly 2.5M visits – 226 percent higher than the previous month’s daily average. This traffic volume accounted for one day, but was almost the same amount of site traffic the company received for all of October. Since then, OnePlus has started allowing users to buy the phone invite-free on Tuesdays, and thus far the phone is as popular as ever. Whether the phone’s popularity would continue to soar if the invite were removed for a longer period of time remains to be seen. But even OnePlus skeptics can agree that there’s something to be said for the relatively unknown brand that – thanks to a clever marketing strategy and the power of social media – has managed to climb to the top of the ranks of mid-range smartphones.